UTech, Jamaica Student Represents Jamaica at United Nations Commission on Narcotic Drugs — UTech, Ja. Mr. Paul Harris (centre, second row), University of Technology, Jamaica (UTech, Ja.) 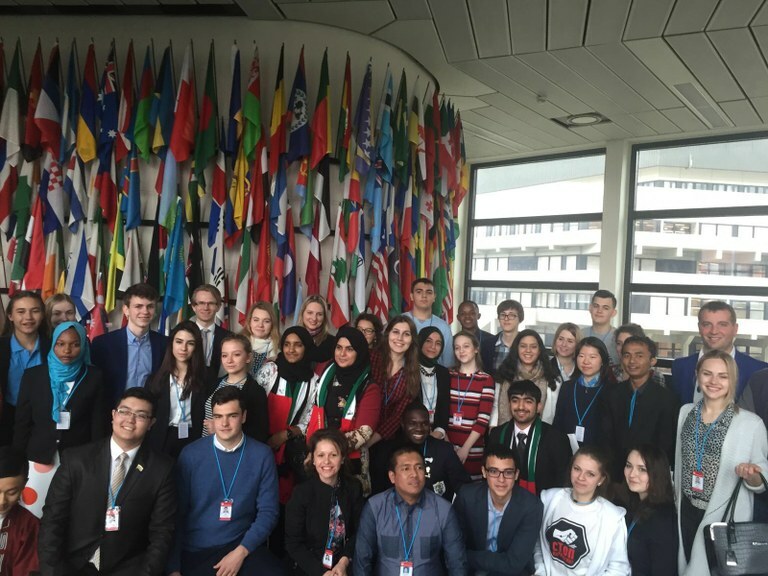 student and Jamaican youth ambassador poses for a photograph with youth delegates at the annual Youth Forum of the 59th Commission on Narcotic Drugs held in Vienna, Austria in March 2016. In recognition for his outstanding work in youth advocacy, Mr. Harris was nominated by Jamaican’s National Council on Drug Abuse to represent Jamaica at the Forum. International Youth Leader, Community Service and Human Rights Activist, budding Politician, and University of Technology, Jamaica (UTech, Ja.) student, Paul Harris is only 19 years old, but he has already accomplished a near lifetime of selfless service at the local and international levels. A second year student in the College of Business and Management, pursuing a Bachelor of Business Administration with a major in Accounting, Paul is as much of an academic as he is an active advocate for youth and community development, particularly for the benefit of vulnerable youths throughout Jamaica. His interest and passion in service and volunteerism germinated at his alma mater, Spanish Town High school where he held various student leadership positions including service on the National Secondary Student Council (NSSC) executive body where he began his advocacy to steer young persons away from the path of illicit drugs and towards making the best use of educational opportunities. As the best example of his own advocacy, Paul has continued to pursue his academic interests in earnest, while finding the time to serve as a founding director of the Portmore based Mitigation and Adaptation to Climate Change organisation where he has partnered with the United States Agency for International Development (USAID) and ACDI/VOCA (Agricultural Cooperative Development International and Volunteers in Overseas Cooperative Assistance) on various projects. He has also served on the St. Catherine Parish Council Executive body and the United Youths Against Drugs (UYAD) based in Spanish Town, St. Catherine. In 2014, Paul launched the International Youth Foundation, an NGO geared towards the development of youth through partnership with local and international organisations. The Foundation’s most recent project was a youth forum held in Spanish Town in January 2016 which included workshops on human rights, drug abuse and youth empowerment. 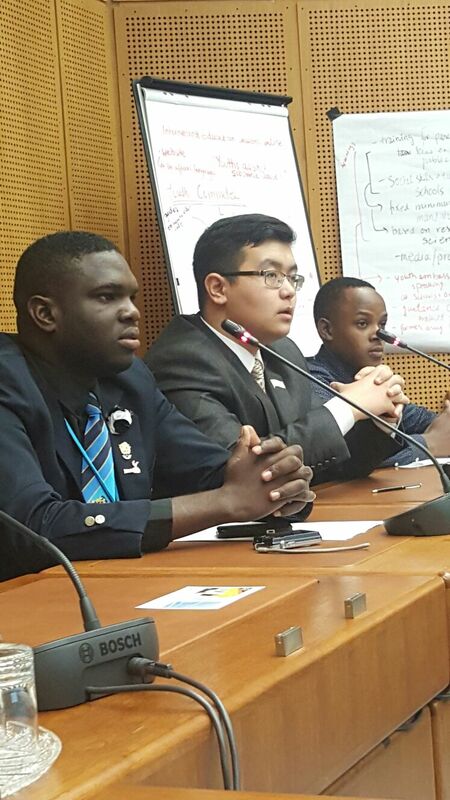 Paul Harris (left) participates in a session of the annual Youth Forum held in Vienna, Austria. In recognition of his outstanding work in youth advocacy and substance abuse, Paul was nominated by Jamaica’s National Council on Drug Abuse (NCDA) to represent Jamaica at the annual Youth Forum of the 59th Commission on Narcotic Drugs held March 14 – 15, 2016 in Vienna, Austria where he was a participant among a group of young people from 27 different countries. The forum facilitated networking among the participants hoping to support learning from the experiences of other youth groups from different regions of the world, as well as on the United Nations Commission on Narcotic Drugs (UNODC) and global policymaking structures, processes and current debates in the field of drug demand reduction. Following his return from his overseas assignment as a Jamaican Youth Ambassador in Austria, Paul was invited to pay a courtesy call on Acting President, UTech, Jamaica, Prof. Colin Gyles on Tuesday, April 5, 2016 where he shared his experiences and stated plans for his future continued drive to “inspire and motivate other youths” Prof. Gyles in commending Paul on his admirable work in community service and volunteerism, noted that it was in keeping with the UTech, Jamaica thrust and the University’s Core Values and encouraged the young student to continue to inculcate the spirit of hope among his peers while adding value in an area that can be very rewarding. Also in attendance at the courtesy call were UTech, Jamaica Officers Mr. Ivor Bennett, Director of Marketing, Mrs. Michelle Beckford, Corporate Communications Manager and Mrs. Jackie Knight-Campbell, Corporate Marketing and Special Projects Officer, Office of the President who all expressed commendation to Paul and a desire for further engagement with him as a role model for his peers. Paul expressed sincere gratitude to his lecturers at UTech, Jamaica and teachers at Spanish Town High School whom he has credited with helping him with his personal growth and development. Prof. Colin Gyles, (2nd right), Acting President, University of Technology, Jamaica presents Paul Harris (centre), College of Business and Management student and Jamaican Youth Ambassador with a gift during a courtesy call on him on Tuesday, April 5, 2016 at the Papine campus. Sharing in the occasion from left are, Mrs. Michelle Beckford, Corporate Communications Manager, Mr. Ivor Bennett, Director of Marketing and Mrs. Jacqueline Knight-Campbell, Corporate Marketing and Special Projects Officer, Office of the President.